Although best known for his acclaimed biographies, historian Martin Duberman is also a renowned memoirist who has plumbed his own life for truths that have meaning for us all. In the bestselling Cures, he carried his story up to 1970, focusing on his fear that homosexuality was pathological and on his desperate search for a therapeutic cure. Duberman’s second autobiographical book, Midlife Queer, centered on the 1970s, by which time he’d thrown off his earlier doubts and become fully engaged in the worlds of gay politics and culture. 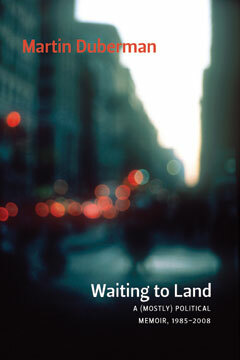 Waiting to Land takes Duberman’s story up to the present day. As his public engagement deepens, Duberman finds himself increasingly at odds with the mounting assimilationism of the mainstream gay movement—and with the left itself, which Duberman has come to believe is smugly oblivious to the realities of gay life. Disaffection leads him to till crucial new ground, including the founding of the groundbreaking Center for Lesbian and Gay Studies (CLAGS) and serving as an original board member of Queers for Economic Justice. Interweaving diary entries with letters and with reflections written in 2008, Waiting to Land incisively probes issues of crucial import for everyone. By turns moving, funny, provocative, and profound, this book is an unflinchingly honest and deeply important window into an extraordinary life.